A massive earthquake hit Washington, D.C. last week. At least that is what it felt like when House Majority Leader Eric Cantor lost his primary to little-known college professor, David Brat. It is hard to exaggerate the extent of this shakeup in our capitol. Cantor stepped down from his position in House Republican leadership, leaving an opening for someone else to step up. Whoever fills this void will in turn leave another opening, and so forth. And what will this loss of a key leadership colleague do to House Speaker Boehner’s standing? The shakeup and resulting turmoil was not just limited to Washington, with aftershocks being deeply felt on Wall Street as well. The Dow was humming along nicely all day Tuesday, flirting with 17,000, then BAM – it fell off a cliff at Wednesday’s open. It wasn’t a huge cliff, but it spent the next few days sinking and finished the week down 148 points. Analysts were quick to lay blame for the drop on the situation in Iraq, which has worsened, but it has been worsening for a long time, if you’ve been paying attention. Islamist militants are slowly taking over Iraq, just like we were told they would, and late Wednesday reports emerged that they were moving into the capital city of Baghdad. That brings more uncertainty to oil markets, much like Cantor’s loss brings uncertainty to Washington, and if there is anything markets hate, it’s uncertainty. 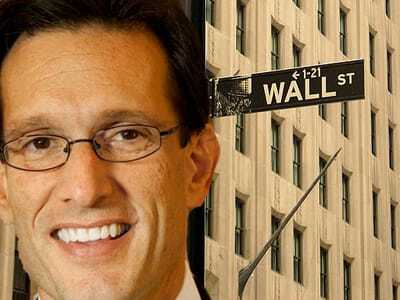 Simply put, Eric Cantor was a friend to Wall Street. Some might even say he was “in the back pocket of” Wall Street. Some of his biggest donors were the Blackstone Group, Scoggin Capital Management and Goldman Sachs. Now those Wall Street donors have to figure out what life for them will be like under the new leadership team, whoever that will be. There are also concerns about the next debt ceiling fight, which could be much different without Cantor’s voice for compromise. What will happen if Republicans dig in their heels even more next time? More government shutdowns? A downgrade of our nation’s bond rating? Will it come with any improvement in spending or fiscal policy? In any case, the simple fact that the markets roil when one politician leaves leadership should say something to people who still think we operate under free market capitalism. That may very well be our ideal, but to say that that’s what we have these days, it wouldn’t be difficult to argue that that’s a stretch. In a truly free market, one politician does not have the influence, power or leeway to upset things to the extent that Cantor’s departure has shaken things up. And, in a free market, one politician is not worth millions of dollars to various corporations to dole out favors and various policies that they want. But when billions are given out in corporate bailouts… when trillions of dollars are printed through Quantitative Easing… when inflation paints so much of the average American’s portfolio into Wall Street’s corner… you can get a picture of how much there really is at stake, and for whom. Politicians should not have this much power. But they do. And they are not wielding it in defense of you, unless you happen to be the CEO of Goldman Sachs. With Wall Street being so beholden to Washington, many Americans are seeing our “free market” for the fallacy that it really is, and are moving their savings out of stocks. Hopefully the changes coming up in House leadership will be good ones for the people, for the average investor, for fairness, equity and free markets. But really, who knows? In the face of uncertainty, for thousands of years, people have turned to gold. And when you’re ready to do the same, we’re here to help.